Borrowing from Sanghadasa's Jaina version of the Ramayana, Mandodari-one of the least known characters of the Hindu epic-is finally given a voice. Considered to be one of the most beautiful apsaras, she was married off to the mighty Ravana, the legendary king of Lanka. In her story, she speaks about her struggles after her marriage, her insecurities and her pious nature that challenged her husband's growing aspirations. 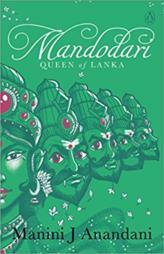 She narrates the rise of Ravana's power and the blunders he made that ultimately caused the downfall of Lanka. Despite her husband's faults, Mandodari loved him and advised him to follow the path of righteousness. Ravana's defeat in a thirteen-day war turned him into a villain. But what if he were the real hero on his side of the war? What if his downfall was a result of scheming to push him out of power? This is Mandodari's story.